Product #31149 | SKU MV88 | 0.0 (no ratings yet) Thanks for your rating! 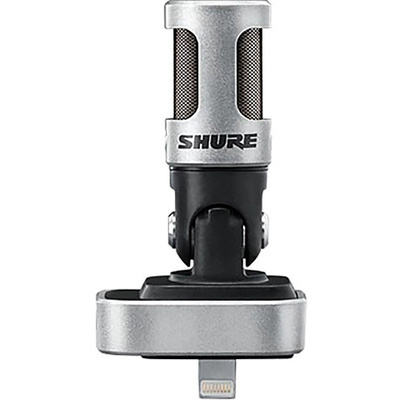 Designed to capture clear, high-quality sound, the MOTIV MV88 from Shure is a stereo condenser microphone that directly connects to any iOS device equipped with a Lightning connector. The professional quality microphone offers up to 24-bit / 48 kHz resolution with a frequency response of 20 Hz to 20 kHz. The microphone element offers a 90° hinge with left/right rotation for flexible audio and video recording options. The MV88 utilises the ShurePlus MOTIV mobile recording app (available free from the app store) for access to mute, gain, and volume controls, as well as stereo width settings, AEQ, and five DSP modes. Each DSP preset offers a different combination of AEQ and compression and includes choices for speech, singing, acoustic, loud, and flat.